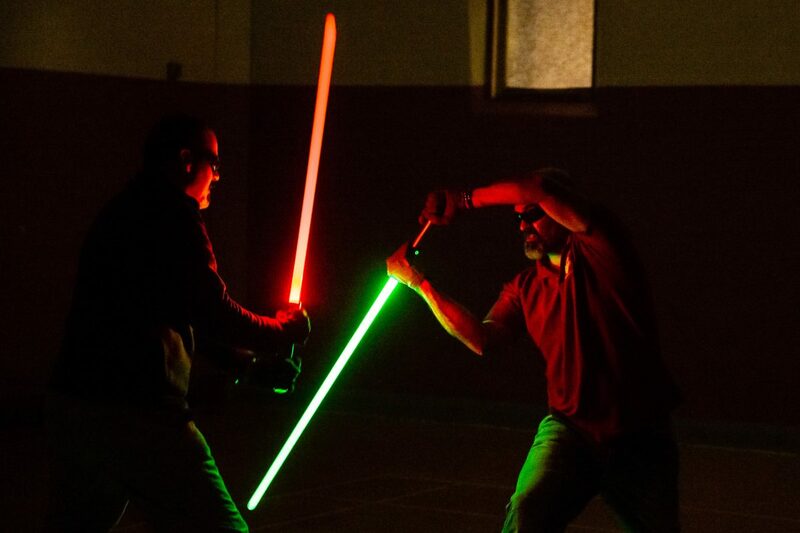 In a community centre, not so far away…Star Wars fans are battling it out like Jedi knights at one of Britain’s only LIGHTSABRE combat academies. 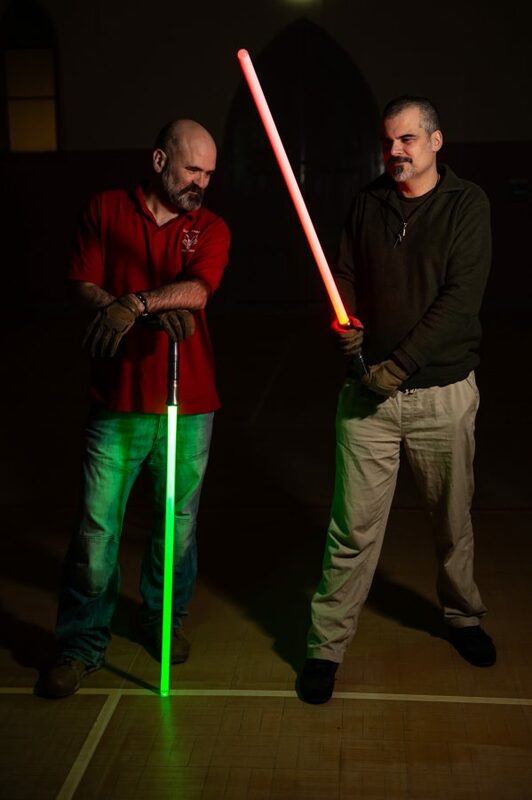 Intergalactic Sabre Masters is believed to be the first martial arts school of its kind to teach members how to fight with lightsabres though the art of mindfulness. Jedi wannabes hope the Force is strong with them as they aim to become Grand Masters and duel with the illuminated weapons in a community hall in Sileby, Leics. 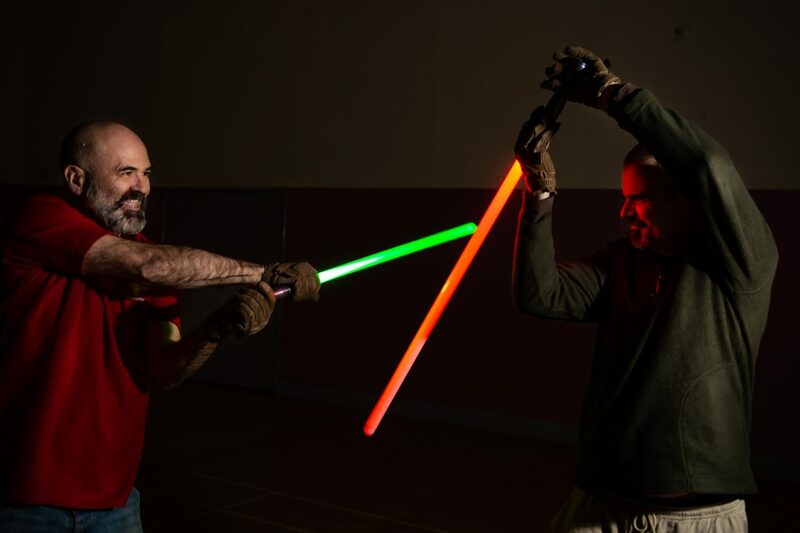 Martial arts expert Dave Holden, 45, spends his Wednesday nights teaching his Padawans the art of battling with lightsabres and says the discipline is “akin to dance”. Every lesson starts with a mindfulness session to help students relax the mind and body in order to cope with the stresses of modern life. Dozens of people have started attended the intergalactic sparring sessions since they were set up as a small community project in 2016. Dave, a dad-of-two, from Leicester, who works as a cyber security analyst, said: “It can be quite a spectacle if you get the light levels right. “When you’re sparring it is more akin to dance as you move in synchronicity with each other, when someone does something, you counter. “We work through specific actions, breaking a movement down into its composite parts. “I have come from a martial arts background in HEMA [Historical European Martial Arts]. but this is unlike other traditional martial arts like boxing and Karate. “These skills are about 500 years old, like medieval sword play where there are moves and counter moves. “Mindfulness is about bringing yourself into the here-and-now rather than constantly thinking about what’s been going on during the day. “You’re spending the time thinking about yourself and relaxing mind and body. It’s all about control of your mind – just like a Jedi would. “It’s also about trust, you’re saying to your opponent that ‘I trust that you are not going to deliberately hurt me’ but you also have to be accepting that errors can happen. “The polycarbonate can hurt and it leaves bruises. The thing about using a sabre is that it is very foreign to people. “Repetition is the way to get around this, you shouldn’t be trying to think too hard about what you’re doing, the moves need to be inherent. The long sessions take place on Wednesdays, between 6.30pm and 7.30pm, and cost £6, with sabres provided. The school makes their own sabres which cost between £260 and £280 and come complete with sound effects. 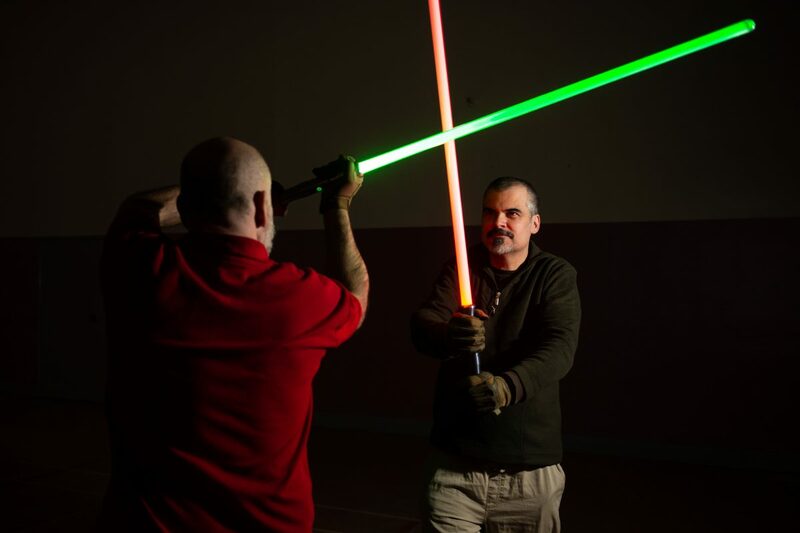 Mel Wilson, a Phd psychology student who also works for Intergalactic Sabre Masters, said: “There are a handful of lightsabre combat schools around but I believe we are unique in our teaching. “We have a different philosophy and focus on the spiritual aspect and are keen to promote mindfulness rather than violence and conflict. “We’re teaching them about responsibility and about keeping control and carrying that forward in their own lives.